My Creative Existence: ATC Royalty. 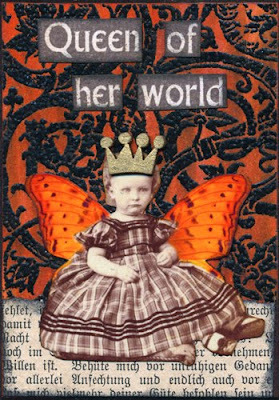 I love creating and swapping Artist Trading Cards (ATC's). The 2 ATC's I'm sharing today have just gone to a new home in Belgium! 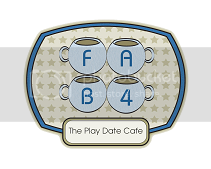 I made this ATC way back in May 2009 as an example for one of the challenges over at Inkurable Stampers. For the background, I stamped a Stamp-it Harlequin background stamp onto white cardstock using black ink. 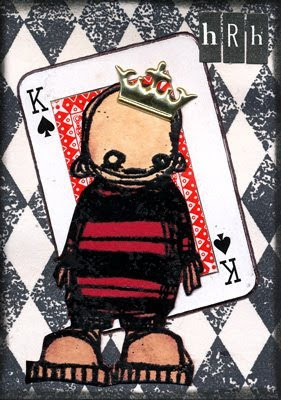 I then got a mini King of Spades playing card (which I got from Big W) and cut out the picture of the king using fine tipped scissors, and stuck the frame to the background. I reversed the King picture, revealing the red pattern on the back of the card, and stuck it back in the hole where I'd cut it from. I stamped "Rocky" onto red cardstock and embossed with black embossing powder. I coloured his face, hands, and shoes with bleach. I then stuck my Rocky stamp cut out to the ATC, attached a gold crown brad, and the letters HRH (His Royal Highness) to finish. For the background I stamped a Darkroom Door stamp (from the Ornate Elements set) onto a Scrapmatts ATC base and heat embossed with black embossing powder. I then coloured the background with an Orange Copic marker (which made the black run a bit, giving it a more distressed look). I tore a piece of gothic script book paper and attached it to the bottom of the ATC. The little girl is a digital collage sheet image (from Enchanted Mercantile - unfortunately no longer operating) that I printed out. Her crown is a chipboard shape that I coloured gold with a Krylon pen. I stamped a stamp that had "Queen of her world" in the design onto cream paper with brown ink, then cut out only the words to use on my ATC. The edges of the words and the ATC were inked with black ink.